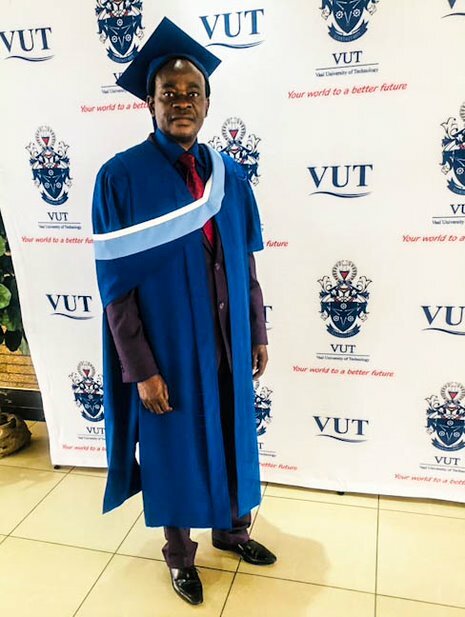 Mr Okpusa Oke, graduated with the Magister Technologiae in Cost and Management Accounting on Tuesday, 09 April 2019. 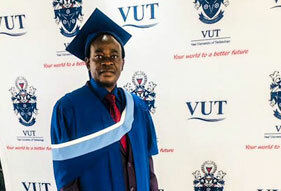 He was a staff member at the Vaal University of Technology, in the Faculty of Management Sciences. He expressed his excitement in receiving the qualification that he has been pursuing. His dissertation was titled; An analysis: Wealth creation by the industrial companies listed on the Johannesburg Stock Exchange of South Africa, 2005-2014. He said that he is a strict person but his students pass his module. “If you have a vision, you have focus despite difficulties that you may face” he said. “It is quite challenging being a lecturer and being a student at the same time… you need to focus on your studies”. Due to scarcity of employment, once students obtain their National Diploma, they opt to focus on their workplace than to better their qualifications. “It is imperative to further your studies as they improve the chance of being promoted at work”. In encouraging staff and students, he said that “it’s better to go big to make it in any industry”.